The authors propose a unique solution to slowing down traffic on the E4 and to having visitors stop at the site and that is the crux of this proposal. Specifically, the highway has been diverted onto the perimeter of the Rajakaari circle motif and the existing roundabouts have been removed. The circle of Rajakaari would be fully built to house facilities suitable for the Productivity theme, such as an information centre, a farmers’ market and a community garden. The circular motif serves as a giant roundabout, slowing down and controlling traffic while also standing out as an attraction. 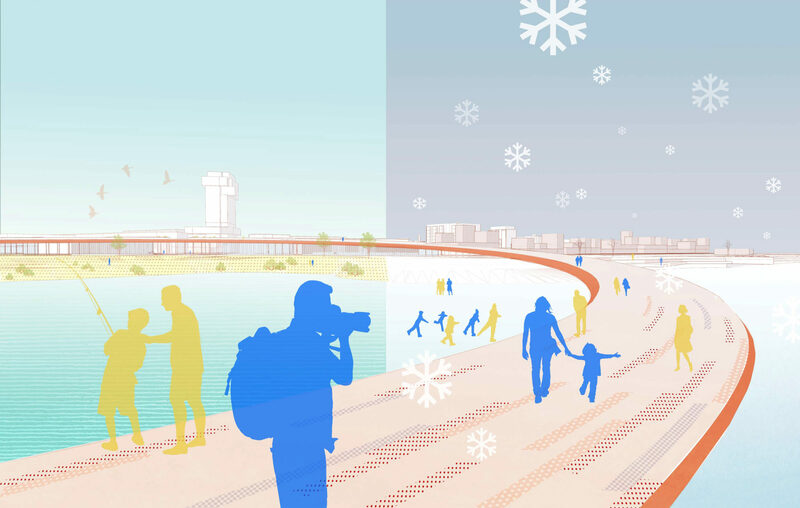 Realigning the E4 also frees the parkland around the river mouth from traffic, making it a more inviting meeting point connecting the two cities. If executed, this type of major visual and functional “gesture” could become a real stopping off point, a destination for visitors from near and far. It would also join the two cities like an engagement ring – and in this respect, this entry met the competition brief better than its competitors. However, the jury was not entirely convinced that the solution would remove the barrier created by the E4. The strong ring motif creates a tension between being inside it or outside it, which can be problematic with regard to connections and views. A large structure in a round shape between the two cities could create a new barrier and block the beautiful sea view from Viktorianaukio square. Moreover, building on top of the sea on such a large scale is not compatible with the environmental conditions of the geographic region, such as the breakup and departure of ice. However, the proposal can be toned down regarding this aspect without compromising the overall concept. A successful execution would require further development and an extremely high standard in the architectural design. The entry nonetheless merits further development and study. The highway has been converted into to a boulevard including the eastern and western edges of the site by extending the block structure across the road without forgetting the all-important trees. On the Tornio side, leaving the seaside open seems justified, because the new block structure gives a beautiful and recognisable silhouette to Tornio. The entry proposes a seaside park with a wealth of leisure amenities. However, the trees designed for the park block the views unnecessarily, both towards the city and the sea. In Haparanda, commercial properties will be added on the northern side of the E4. The structure and scale of the blocks as well as the volume of building are well suited for the context. The blocks are basically closed blocks, but the variation in the massing of the blocks and leaving some sides of the courtyards open helps integrate the blocks into the diverse architecture of the twin cities. The architecture in this entry is presented in a highly schematic manner, but the agreeable and varied massing seems to provide a good basis for planning. The blocks follow the principles of a pedestrian-friendly city so that the permanent parking spaces have been placed inside the blocks, and the outer perimeter of the block is reserved for activities. How this solution would be executed in the local context is difficult to envisage. The western-most closed block development in Tornio is outside the competition site and, in fact, a point block is currently being built on the site. This will not, however, undermine the overall concept of the proposal, even if this specific city block ended up forming an interesting gateway together with the circular building. Our proposal focuses on re-negotiating the hierarchy of elements a border condition creates and questions the future of production. We decided not to let cars dictate the condition of the street, but rather have the pedestrian reclaim the landscape. Our proposed ringed space embraces the border, softens the status of the road, and marries both sides together while the pattern of dispersal established by the ring has the potential to promote further growth out into both countries. Through a subtle shift in the path of the E4 highway and a modification of its profile, we believe we can attract residents, visitors, tourists, and business. By compiling two large sidewalks, parallel parking between trees, two bike lanes and a planted island, the new road functions as a unifying boulevard. Strategically located knuckles at the intersection of the ring and boulevard act as gateways that invite visitors to explore the rest of the cities by highlighting shopping corridors on each side of the border. The ring is a symbol of interconnectedness, unity and cooperation. As an object, it is an emphatic element embracing the border that showcases Tornio Haparanda’s relationship and exploits productivity in the urban environment. Upon crossing the threshold of the ring, pedestrians enter a green network of planted berry bushes, forage gardens, mown paths, and spontaneous vegetation. The varied paths of circulation promote use of the entire site in new ways. The development of enclave-like blocks prompts small business and industry in the region. This incubator-like model emphasizes local productivity through collaboration at a smaller scale. We are proposing to group similar small factories in adjacent adaptable spaces. Here, resources can be shared at the interior of each block while the streetscape is opened up to visitors and patrons. Essentially, this proposal brings to light the artificiality of the border condition. There is no hard line between these regions which share a deep cultural bond and respect for the natural environment. By uniting the sides through a ringed intervention, we highlight the focal point between the countries and marry the two sides into one cooperative space which completely obliterates that division. Finding a balance between the vehicle and the pedestrian, be they tourist or resident, is the key to the success of Tornio Haparanda.